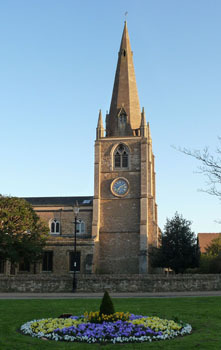 Scroll down for photos of St Neots. Heaviest 5: Leighton Bromswold, 21cwt in Eb! How do change ringing bells work? Text from Wikepedia. 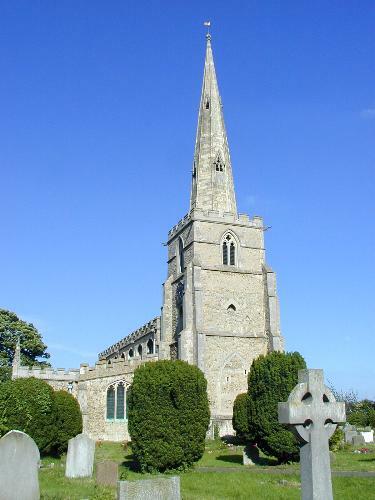 Today some towers have as many as sixteen bells which can be rung together; six or eight bells are more common for the average church. The bell highest in pitch is known as the treble and the bell lowest in pitch the tenor. For convenience, the bells are referred to by number, with the treble being number 1 and the other bells numbered by their pitch—2,3,4, etc.—sequentially down the scale. (This system often seems counterintuitive to musicians, who are used to a numbering which ascends along with pitch.) 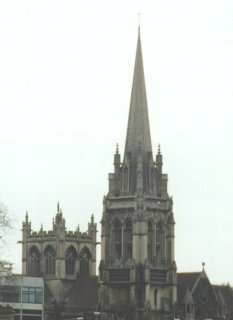 The bells are usually tuned to a diatonic major scale, with the tenor bell being the tonic (or key) note of the scale. 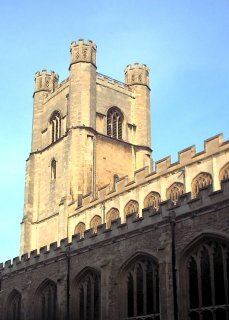 Some towers contain additional bells which are used to allow different subsets of the full number to be rung, still to a diatonic scale. For instance, many 12-bell towers have a flat sixth, which if rung instead of the normal number 6 bell allows 2 to 9 to be rung as light diatonic octave; other variations are also possible. The bells are mounted within a bell frame of steel or wood. Each bell is suspended from a headstock fitted on trunnions (plain or non-friction bearings) mounted to the belfry framework so that the bell assembly may rotate. When stationary in the down position, the center of mass of the bell and clapper will be appreciably below the center line of the trunnion supports, thus giving a pendulous effect to the assembly and it is this dynamic which is controlled by the ringer's rope. The headstock is fitted with a wooden stay which, in conjunction with a slider, limits maximum rotational movement to a little less than 370 degrees. To the headstock a large wooden wheel is fitted and to which a rope is attached; the rope wraps and unwraps as the bell rotates backwards and forwards. This is full circle ringing and quite different from fixed or limited motion bells which chime. Within the bell the clapper is constrained to swing in the direction that the bell swings. The clapper is a rigid steel or wrought iron bar with a large ball to strike the bell. The thickest part of the mouth of bell is called the soundbow and it is against this that the ball strikes. Beyond the ball is a flight which controls the speed of the clapper. In very small bells this can be nearly as long as the rest of the clapper. Below the bell chamber there may be one or more sound chambers, (one of which is likely to house the clock mechanism if the church has one) and through which the rope will pass before it drops into the ringing chamber or room. Typically, the rope's length will be such that it falls close to or on to the floor of the ringing chamber. About 5 feet (1.5 m) from the floor, the rope will have a woolen grip called the sally (usually around 4 feet (1.2 m) long) while the lower end of the rope will be doubled over to form an easily held tail-end. Unattended bells are normally left hanging in the normal ("down") position but prior to being rung, the bells will be rung up. In the down position the bells are safe if a person touches them or pulls a rope. A bell which is up is dangerous to be near and only expert ringers should ever contemplate entering a bell chamber or touch a rope when the bells up. The ringer pulls on the rope and starts the bell swinging. Each time the bell swings the ringer adds a little more energy to the system, similar to pushing a child's swing. Eventually there is enough energy for the bell to swing right up and be left over-center just beyond the balance point with the stay resting against the slider. The bell ringers typically stand in a circle around the ringing chamber, each managing one rope. Bells and their attendant ropes are so mounted that the ropes will be pulled in a circular sequence, usually clockwise, starting with the lightest (treble) bell and descending to the heaviest (tenor). To ring the bell, the ringer will first pull the sally towards the floor, upsetting the bell's balance and causing it to swing on its bearings. As the bell swings downwards the rope unwinds from the wheel and the ringer adds enough pull to counteract friction and air resistance. The bell winds the rope back onto the other side of the wheel as it rises and the ringer can slow (or check) the rise of the bell if required. In change ringing where the order in which the bells strike is constantly being altered, it is necessary to time the swing so that this strike occurs with precise positioning within the overall pattern. Of course, precision of striking is important at all times. To ring quickly, the bell must not complete the full 360 degrees before swinging back in the opposite direction, while ringing slowly the ringer waits with the bell held at the balance, before allowing it to swing back. To achieve this, the ringer must work with the bell's momentum, applying just the right amount of effort during the pull that the bell swings as far as required and no further. This allows two adjacent bells to reverse positions; the quicker bell passing the slower bell to establish a new pattern. Although ringing up certainly involves some physical exertion, actual ringing should rely more on practiced skill than mere brute force; after all, even the smallest bell to be encountered in a tower will be much heavier than the person ringing it. The heaviest bell hung for full-circle ringing is in Liverpool Cathedral and weighs over four long tons (over four metric tons). Despite this colossal weight, it can be safely rung by one (experienced) ringer. 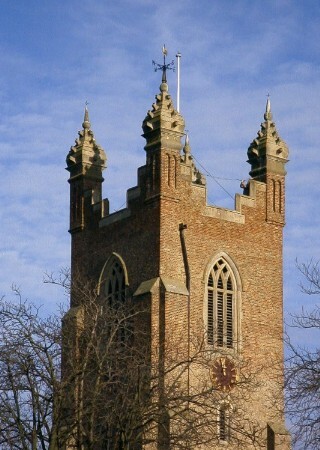 St Neots belfry. Tenor (centre) 29cwt with a diamiter of 54.88" Photo by Geoff Greyton. The ring at St Bartholomew's Tong in shropshire. It is a pretty normal ring of six with a 12cwt tenor. But...There is a much larger bell in the tower. The Great Bell Of Tong is around 46cwt (over 2tons!) and is hung on the middle chamber between the ringing chamber and Belfry. Subpages (1): Unringable Rings in Cambridge, Ely, Wisbech & Huntingdon Districts.